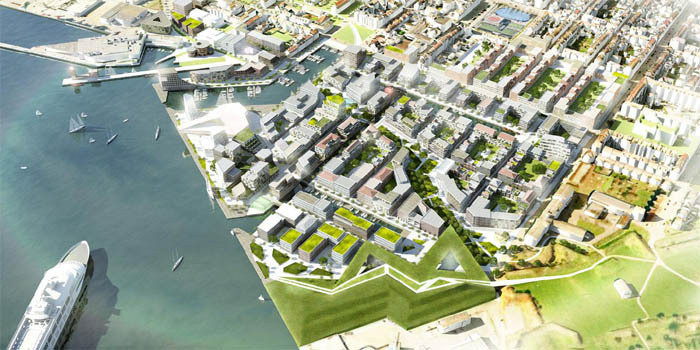 KCAP Architects&Planners, together with advisors Ramboll and Fakton, win the international competition for the urban development plan FredericiaC in the Danish city of Fredericia. The project will establish a new destination in the region, create new correlations in the city and add a unique inner-city district in an attractive maritime environment. The multidisciplinary team elaborated the winning proposal in an exceptionally open process, guided by FredericiaC, a partnership between the Local Authority of Fredericia and Realdania By. This form of competition allowed an ongoing dialogue with the organisation, the stakeholders, local citizens, experts and the competing design teams during the design process. The all-embracing urban planning concept combines the best and most characteristic elements of Fredericia – a historic garrison town and a harbor city – in a coherent urban ensemble. The renaissance grid layout of the inner city is continued, extending view lines into the site. The impressive vaults around the city will be connected and made accessible by a new park, and the existing seafront will be enriched by a network of canals, strengthening the cities relation to the water. The planning principles dictate a varied mix of different uses, urban typologies and architectures. Within these principles, the urban development is highly adaptable to any future changes that might affect the development process. The plan sets out a flexible phasing strategy with short term interventions, pioneers and temporary events to promote the site. A financial strategy guaranties the feasibility of the project in every stage. The concept takes a sustainable approach to the redevelopment of the brownfield area. It includes solutions for the present issues of soil contamination and environmental risks of neighboring harbor activity and prescribes a green building code, waste strategy and sustainable transport strategy. With feasible investments in sustainable energy supply from wind turbines, district heating and sea water cooling, the whole development will become CO2 neutral. In an interactive and inclusive process KCAP, Ramboll and Fakton will elaborate the winning proposal towards a definite development plan which is planned to be presented the first half of 2012.